Posted October 8th, 2018 by MWC & filed under Featured, Legal News. Morrow Willnauer Church, LLC is pleased to announce the addition of Frederick R. Schleipman to the firm. Mr. Schleipman is a 2018 graduate of the University of Missouri – Kansas City, School of Law. 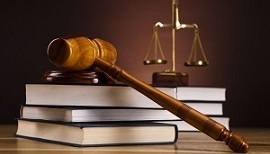 Mr. Schleipman will concentrate his practice in the area of civil litigation in Missouri. Posted May 30th, 2018 by MWC & filed under Featured, Legal News. The term “comorbidity” describes two or more disorders or illnesses occurring in the same person, at the same time or one after the other. See “What is Comorbidity,” National Institute of Drug Abuse, March 2011. Comorbidities can also imply interactions between the illnesses that can worsen the course of both. Id. Because comorbid conditions are by definition medical disorders or diseases that can either accompany or affect the primary condition or injury, comorbidities can have a significant impact on litigation. See generally “Common Comorbidities Found in Workers’ Compensation: How Comorbid Conditions Impact Claims,” Optum, 2017. Common comorbidities include: high blood pressure, heart disease, chronic pain, insomnia, obesity, depression, arthritis, diabetes, tobacco use, alcohol abuse, and previous traumas. In workers’ compensation, the existence of comorbid factors has significant impact on claims, particularly the length of time until a claimant reaches maximum medical improvement. In 2012, the National Council of Compensation Insurance (“NCCI”) investigated the impact of comorbidities on workers’ compensation claims. See generally Law, C. & Colon, D., “Comorbidities in Workers’ Compensation,” NCCI, October 2012. In that study, the NCCI found that the percentage of worker’s compensation claims with a comorbid diagnosis, such as diabetes, hypertension, or obesity, increased from 2.4% to 6.6% between the years 2000 and 2009. Id. The NCCI attributed this significant increase to the overall progression of illness rates among the general population. The study also found claims with a comorbidity diagnosis have about twice the medical costs of otherwise comparable claims. Id. An emerging body of evidence demonstrates that depression and physical disorders are commonly comorbid. Depression as a comorbidity is related to a poor quality of life, worse outcomes of the physical disorders, increased mortality, higher medical costs, greater disability, and a heightened functional impact than when either depression or a medical disease is present alone. See Kang, Hee-Ju, Kim, Seon-Young, Bae, Kuyng-Yeol, Kim Sung-Wang, Shin II-Seon, Yoon, Jin-Sang, and Kim, J, “Comorbidity of Depression with Physical Disorders: Research and Clinical Implications,” Chonnam Medical Journal, April 14, 2015. In injured workers, the combination of stress, a decrease in daily activities, concerns over money, feelings of worthlessness or hopelessness, and even the side effects from some medications can result in feelings of depression. See id. The injured workers’ resulting depression can prolong and increase the effects of pain, which in turn increase medication use and/or extend claim duration. Id. Approximately 50% of patients with chronic pain have some degree of depression, and chronic pain patients are four times more likely to experience anxiety or depression than those not affected by chronic pain. Id. According to a study published in the Journal of Occupational & Environmental Medicine in 2012, the odds of injured workers being treated for depression were 45 percent higher than those of non-injured workers. The study, which was conducted by researchers at the Centers for Disease Control and Prevention, points out that while additional costs related to depression are present, on a nationwide basis they sometimes are not covered by the workers’ compensation system, so employers or the claimants themselves are responsible for the costs. Id. However, Nebraska courts have illustrated a willingness to include treatment for depression as work related when it also involves a claim for physical injury. Under the Nebraska Workers’ Compensation scheme, with the exception of a small carve out for first responders, psychological injury on its own is not compensable. Generally, injury means “only violence to the physical structure of the body and such disease or infection as naturally results therefrom…” Neb.Rev.Stat. § 48-151. In one case tried prior to the first responder carve out, the Court found a compensable injury under the Act must involve “some physical stimulus constituting violence to the physical structure of the body.” Zach v. Neb. State Patrol, 273 Neb. 1, 10-11, 727 N.W.2d 206, 213 (2007). The Court held that because the injury to Zach was alleged to have resulted entirely from a mental stimulus, no claim was stated under the Workers’ Compensation statutory scheme. For most workers it remains necessary for some physical injury to occur before psychological injury or treatment is compensable. For instance, in a recent case an employee twice injured her upper extremity on the job. Jurgens v. Irwin Industrial, 20 Neb. App. 488, 825 N.W.2d 820 (2013). The workers’ compensation court awarded permanent partial disability benefits, past and future medical expenses, and vocational rehabilitation. Jurgens attended classes as part of her vocational rehabilitation, but reported that she was in constant pain and felt overwhelmed. As a result, she dropped out. After dropping out of the vocational rehabilitation program, Jurgens sought a modification of her award, claiming an increase in incapacity due solely to work-related injuries. Irwin Industrial and the State of Nebraska, Workers’ Compensation Trust Fund, opposed the modification. The Court of Appeals found that the upper extremity injuries had aggravated her preexisting depression due to the pain, and such led to an avoidance of physical activity. The Court of Appeals affirmed the lower court’s finding that due to her depressive symptoms, Jurgens suffered an increase in her incapacity due solely to the work-related injuries, and had suffered periods of both temporary total disability and temporary partial disability. Id. The Jurgens Court further affirmed the finding that the employee had not yet reached maximum medical improvement (MMI) for her depression and awarded benefits accordingly. Id. In another case, the Court of Appeals refused to declare the claimant at MMI when he continued to suffer the symptoms of secondary depression arising out of his work-related shoulder injury. Adamson v. Horizon W., Inc., No. A-13-1011, 2015 Neb. App. LEXIS 73 (Apr. 28, 2015). The treating physician in Adamson noted that “[t]he components of Adamson’s chronic pain syndrome [chronic left shoulder pain, left ulnar neuropathy, inability to function in usual social roles, depression, anxiety, insomnia, inability to adapt to stress] mutually aggravate each other in sets of complex, interlocking vicious cycles, which must be addressed simultaneously in treatment planning in order to achieve reduction of pain.” Id. With regard to the assaults, Hynes alleged that she suffered from posttraumatic stress disorder and depression as a result of three incidents which occurred during the course of her employment as a nurse in the mental health unit of Good Samaritan Hospital. Hynes alleged that because of these incidents she was no longer able to work. The physical impact of the assaults was very minimal. Hynes only sought medical treatment for a physical injury once, when a patient “whipped” Hynes with a large vacuum cleaner cord and allegedly punched her in the jaw. Hynes stated she suffered bruising and substantial pain as a result of the assault. Hynes also described a second incident, where she was kicked and was bitten on the arm by a patient. She did not seek medical treatment for the alleged physical injuries. Hynes reported a third incident in which a male adolescent grabbed Hynes and made “extremely aggressive” sexual comments to her. Hynes did not receive treatment for physical injuries associated with this assault. Id. Paula Malin, M.D. was offered as the claimant’s expert psychiatric witness. In her report, Dr. Malin opined that Hynes suffered psychological and physical injuries in the first assault and that the second and third assaults caused cumulative trauma. Good Samaritan unsuccessfully sought to have Dr. Malin’s opinion excluded and argued that Dr. Malin’s opinion did not adequately take into consideration the claimant’s previous trauma. Another expert report was authored by Howard Entin, M.D., a court-appointed psychiatrist from Colorado. Dr. Entin opined that “while Hynes had a major depressive disorder, she did not meet the criteria for PTSD and ‘did not experience an event that was a significant threat to her life at work.’” Dr. Entin opined that Hynes might have PTSD related to significant preexisting stressors. Id. at 264. His opinion was rejected by the lower court because the court felt he applied a Colorado burden on the claimant that was not present in Nebraska. Id. One of the main points of contention on appeal was the consideration of the second and third incidents in the determination of Hynes’ disability. Good Samaritan argued that there was no proof Hynes suffered a physical injury in either the second or third incident, therefore, neither was independently compensable under the current Workers’ Compensation Act. Good Samaritan also argued that because the second and third incident would not be compensable, that they should not be considered in any expert opinion with regard to causation. The Court does not view [Hynes’] claim to be for three separate accidents but rather . . . as an initial accident with two subsequent incidents which aggravated or cumulatively added to the damage and injury to [her] mental health which began with the first accident. In this regard there is clear evidence that the first assault with physical injury caused immediate mental difficulties for which [Hynes] sought treatment. There is evidence that the first and second assaults involved physical injury with psychological injury. . . . There is evidence in the record to support a finding that the third assault aggravated the preceding compensable injuries all of which injuries are compensable under the Nebraska Workers’ Compensation Act. Id. The Nebraska Supreme Court stated that “[a] separate compensable injury for each and every work aggravation is not required if the initial cause of the injuries is a direct and natural result of the compensable injury.” Id. The Supreme Court found that the workers’ compensation court “was not clearly wrong in finding that Hynes’ injuries were the result of the initial “accident” [ ], with two subsequent incidents that aggravated or cumulatively added to the injury.” Id. The Court cited to a previous case in its affirmance, Worline v. ABB/Alstom Power Int. CE Servs., 272 Neb. 797, 725 N.W.2d 148 (2006). Worline held that where the evidence is sufficient to permit the trier of fact to find that a psychological injury is directly related to the accident and the employee is unable to work, the employee is entitled to be compensated. All of these cases, and particularly the Hynes case, demonstrate that it is necessary to think seriously about a claimant’s psychological history early in the case. Clearly a claimant’s psychological comorbidities can have an extreme impact on the potential value of the claim and the course of treatment. Given the relative recentness of the decision in Hynes, it is difficult to say whether there will be an increase in awards where relatively minor physical injuries will give rise to total and permanent disability based on psychological trauma, but it is nevertheless a case which should always be considered when valuing a matter. Posted March 19th, 2018 by MWC & filed under Featured. Morrow Willnauer Church, LLC is pleased to announce that a new associate, Lindsay A. Schermer, has become affiliated with the firm. Lindsay is a 2017 graduate of the University of Kansas School of Law. She has handled numerous hearings and jury trials, mostly in criminal law cases. Posted November 13th, 2017 by MWC & filed under Featured, Legal News. Morrow Willnauer Church, LLC is pleased to announce that four new associates have become affiliated with the firm. Aaron R. Schuman is a 2014 graduate of the University of Missouri — Kansas City, School of Law. Following his graduation, Mr. Schuman worked for the Missouri Public Defender’s Office. Mr. Schuman will concentrate his practice in civil litigation and continue his practice in criminal defense. Joanna B. Orscheln is a 2014 graduate of the University of Missouri — Kansas City, School of Law. Following her graduation, Mrs. Orscheln worked for the Jackson County Prosecuting Attorney’s Office. Mrs. Orscheln will concentrate her practice in civil litigation. Blake H. Butner is a 2016 graduate of the University of Missouri — Kansas City, School of Law. Following her graduation, Ms. Butner was in private practice at a northwest Missouri firm where she focused on probate and appellate litigation. Ms. Butner will concentrate her practice in civil litigation. Posted January 18th, 2017 by MWC & filed under Featured. Morrow Willnauer Church is proud to congratulate Daniel Church on his appointment as the 2017 Chair of the Legal Committee for the Professional Liability Defense Federation (“PLDF”). The Legal Committee is the largest committee of PLDF. Posted January 11th, 2017 by MWC & filed under Featured. Morrow Willnauer Church, LLC is pleased to announce the addition of Kristan M. Dames to the firm. Ms. Dames is located at our Saint Louis Office. Ms. Dames is a 1996 graduate of Saint Louis University School of Law. Ms. Dames focuses her practice in the area of worker’s compensation defense of employers and insurers in Missouri. Morrow Willnauer Church, LLC is proud to announce that Karie Casey has become a Member of the firm. Ms. Casey is a 1990 graduate of the Saint Louis University School of Law. Ms. Casey focuses her practice in the area of worker’s compensation defense of employers and insurers in Illinois and Missouri. Posted January 11th, 2017 by MWC & filed under Featured, Legal News. Congratulations to Morrow Willnauer Church LLC for being recognized by A.M. Best with the BestMark icon. This industry-recognized icon that senior insurance and claims executives look for when choosing service providers reflects the firms passion to provide the highest level of expertise to our clients. Posted September 21st, 2016 by MWC & filed under Featured, Legal News. 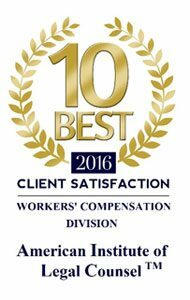 Congratulations to Randy Schroer, Member, for being recognized by the American Institute of Legal Counsel as one of the “10 Best” Workers’ Compensation Attorneys for Client Satisfaction in Missouri.